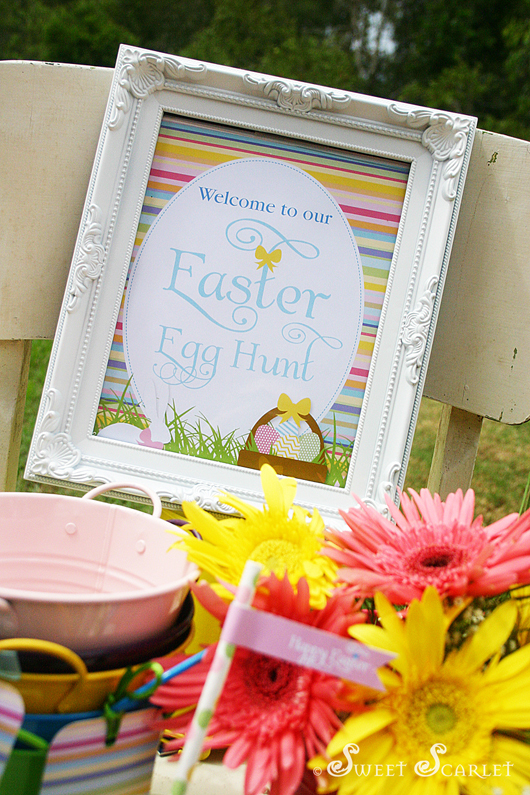 Easter herald's the arrival of Spring! 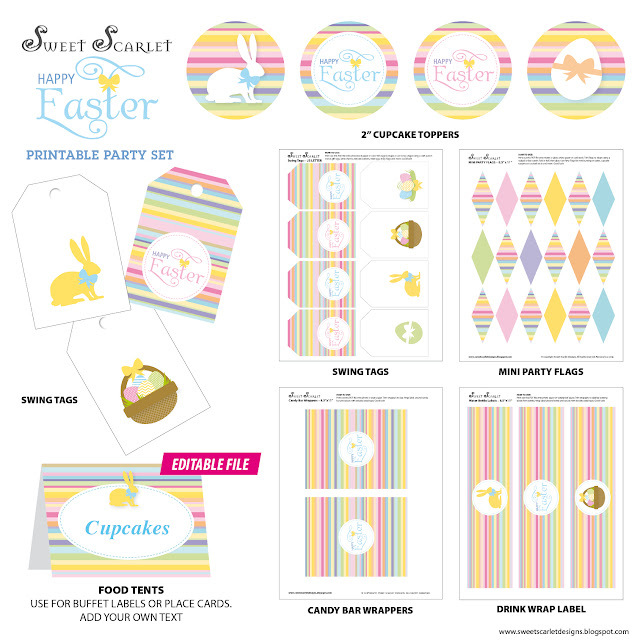 And that is exactly what I wanted to capture in this fun, colorful and bright Printable Easter Collection. I was inspired by the some beautiful grosgrain ribbon for the striped pattern and the bunnies and bows seemed the perfect partners. I added fresh flowers to this dessert table to make it even brighter. My kids had a great time helping me paint the striped eggs. 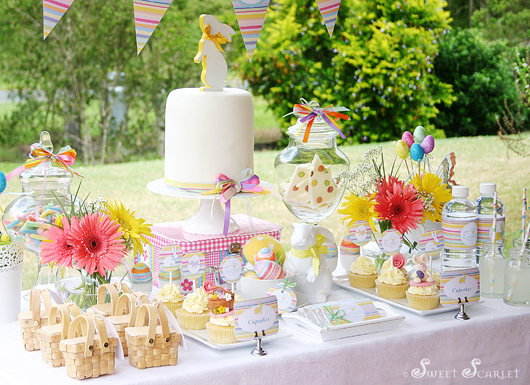 I used different widths and textures of pastel-colored ribbon to decorate the cake and candy jars, to tie in with the stripes. For the food I made classic double-vanilla cupcakes, from my favorite recipe – which turns out perfectly every time. I also made "Easter Bark" from white chocolate and candies. This was such an easy party food to make and it looks good too. 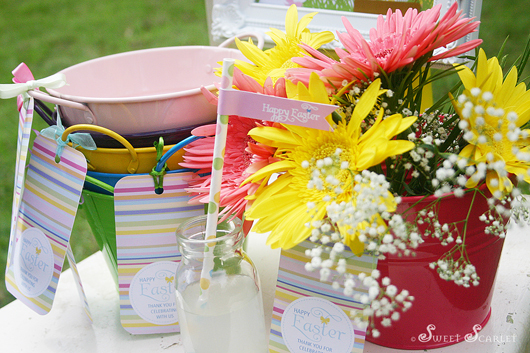 I finished the table with traditional lemonade in glass bottles with paper straws and loads of Easter favors. 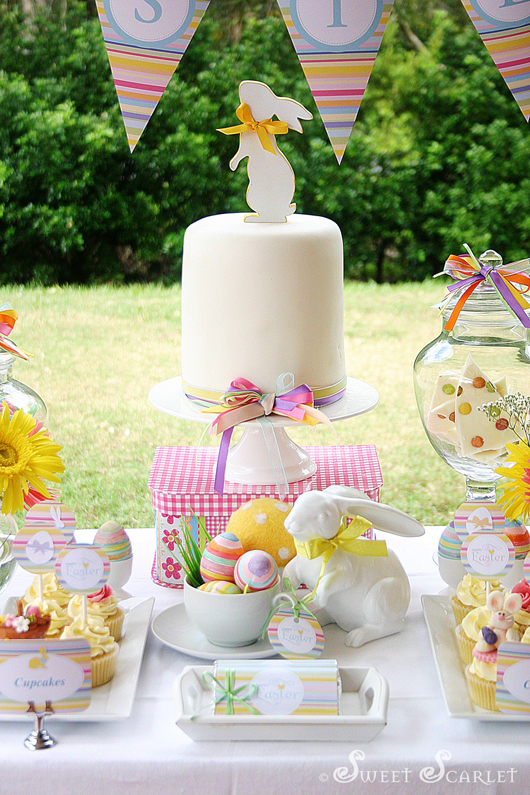 The centrepiece Easter cake is a 6" vanilla buttercake. 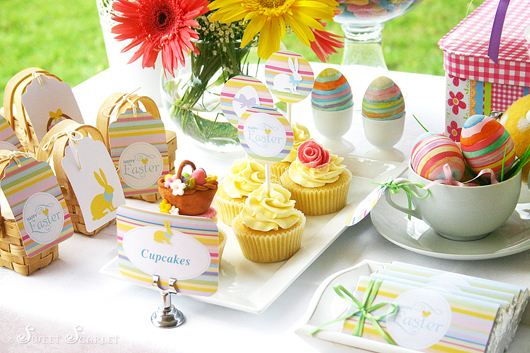 This DIY Easter Printable Collection includes 2" Cupcake Toppers, Bunting, Large Swing Tags (perfect for favors), Editable Buffet Tags, Straw Flags, Large Favor Tags, Mini Party Flags, Candy Bar Wrappers, Water Bottle Labels and two 8"x10" Party Signs – "Happy Easter" and "Welcome to our Egg Hunt". I wish you all a very happy and safe Easter. Please see below for vendor credits. 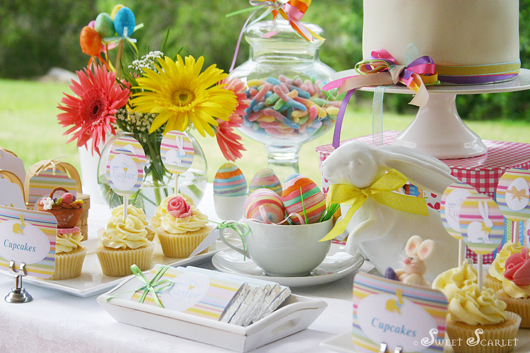 Fresh flowers can add beautiful color to a dessert table. 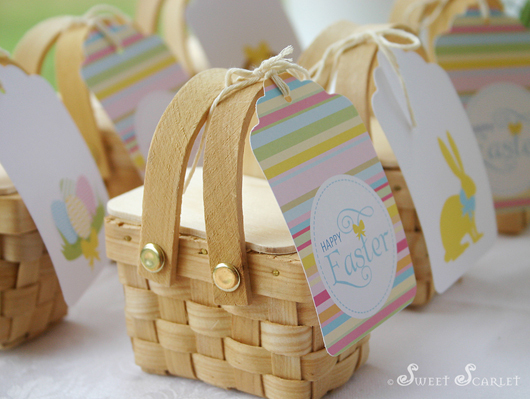 Large Swing Tags, Editable Buffet Labels, 2" Cupcake Toppers and Candy Bar Wrappers. 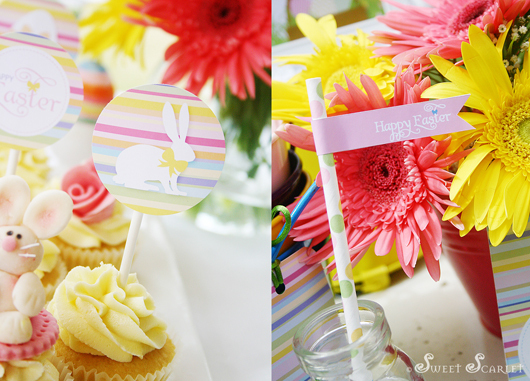 decorate the cake, and topped it with a cute bunny decoration. 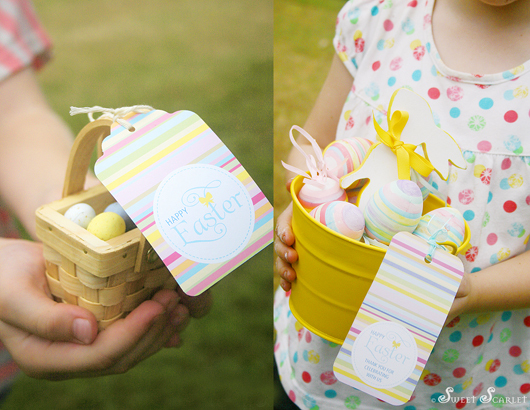 Add printable Swing Tags or Favor Tags to your Easter gifts. Absolutely gorgeous everything Elise! 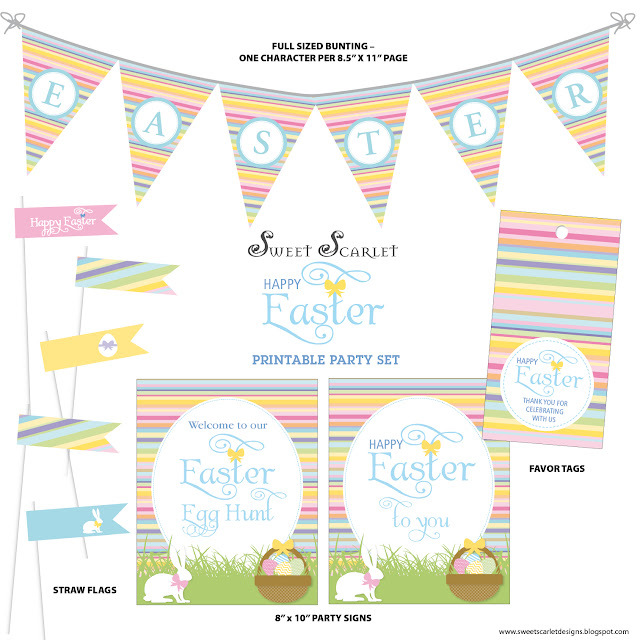 the printable, the table setting... you must have spent a lot of time on this one! This is beautiful Elise! Can you tell me where you got the great mini baskets? Beautiful! 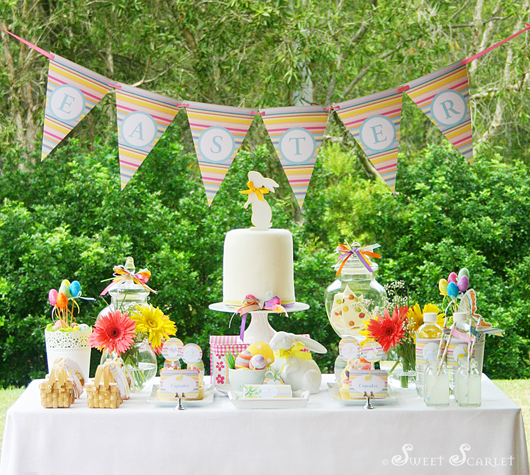 I will do an easter dessert table roundup and I will feature your's! gorgeous! I;m following you on FB & Pinterest. Can't wait to see the feature – much appreciated! 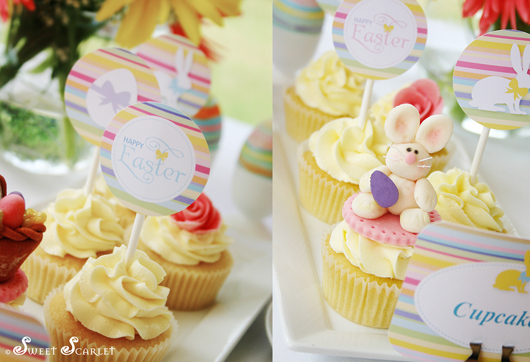 Found this way too late for Easter...but not too late to gush over how pretty this is! A darling collection!